It's been a very harsh winter throughout much of the country, but hopefully the changing of the seasons is just around the corner. In that spirit, our Product of the Week is the Splendid Spring Bouquet. 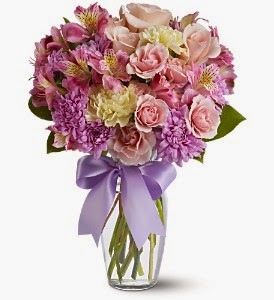 This delicate arrangement features gentle tones of lavender, pink and yellow. Pink Spray Roses, Pink Alstroemeria (Peruvian Lilies), Yellow Carnations and Lavender Cushion Chrysanthemums make this a perfect assortment to lift your mood as the last days of winter tick off the calendar. Check it out at Bloomex.ca today and view some of our past products of the week by clicking the directory below. Bloomex and H&S Thanks YOU!